To save the battery, many phone have feature to automatically lock screen after certain period of time. While this feature is usefule, it can be annoying at times with screen locking automatically. 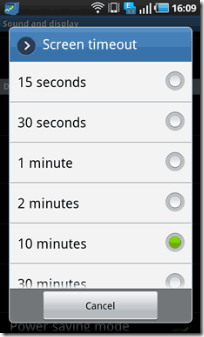 By default, 30 seconds or 60 seconds is the lock time on an Android mobile phone. If this time is too short or long, you can easily change it as per requirement on your Android powered mobile phone. 1. On your Android phone, press Menu key > Setting. 3. Select time out period to lock screen automatically from the given list. You can change time among: 15 seconds, 30 seconds, 1 minute, 2 minutes, 10 minutes and 30 minutes. Thank you for the timeout information!! It helped.